What do you mean by Persuasive essay? A persuasive essay or persuasive writing is a form of essay writing and is mainly focused on the argumentative side of writing. It is also called as argument essay which basically utilizes the reasoning and the logic to portray an idea or a number of ideas over a certainly described pointers. Its arguments about one point and why that one point is more legitimate than the other one. The persuasive essay writing has a tendency to persuade the reader to adopt a particular point of view or opinion or to consider taking a particular action altogether. Persuasive essay writing is usually stuffed with a lot of facts, figures, and logical statements, examples standing those statements and quoting experts of that particular field. The main goal of any persuasive essay writer should be to convince the readers about the point, which he or she is making in the essay and by making the reader trust you with your writing. This type of essay writing is particularly helpful in raising awareness and also for a strong building of core understanding of a subject to the readers. Persuasive essays are universal and versatile which are found everywhere. Newspapers, blog writings, political speeches, advertisings contain these type of persuasive and argumentative essay write-ups. There is a five-step writing process of a persuasive essay, which is the best approach for writing these kinds of essays. Remember, these essays are not written to give information, but to prove a certain point or view. This is the foundation laying step of the persuasive essay writing. This part is extremely important and the writers should go through all the points in this pre-writing phase itself. Firstly, the writer has to choose a position. The position indicates which side, he or she is going to take in this persuasive writing. This is important as it will determine how the writing proceeds. The writer should always choose a side with which he or she is pretty much familiar and have a sound knowledge about. The side which they choose to advocate should have good things and strengths, which the writers should be, vary of. Secondly, the writer should be thoroughly familiar with the nature of their audience. Understanding the audience is very important. The writer should know the reader’s perspective and should write according to their understanding. Thirdly, does some sound research work on the topic. 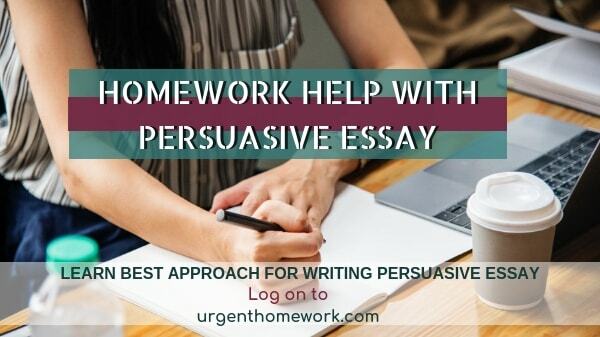 The persuasive essay writing requires solid and convincing evidence which will back the points made in the essay. Internet sources, books and enlisted sources are some of the best sources for good research work. Make notes and study those notes. And finally, identify the most convincing evidence out of the notes and study the key points of the opposing view. The second step of this persuasive writing is to draft the writing into a structured format. The structure of a persuasive essay starts with an introductory paragraph, which should consider a strong hook, for grabbing the attention of the readers at the very first. The reader’s attention is one very important and if not grabbed, then it may become boring or dull for the reader. Start with an unusual anecdote or question or a statistic which will engage the reader at the very go. The next part is the thesis statement which should be written with strong statements and the good part about the subject. It should leave no doubts in the minds of the reader. After the thesis statement, all the paragraphs or the body should cover a specific pointer and should clarify the opinion chosen on the basis. The writer has to ensure that each paragraph should talk about the different view and must cover all the facts and points regarding that. The sentences of that paragraph should ensure strong evidence in the form of statistics, quotes, facts and real examples. The writer should be able to make various viable ways to make an argument and should include using the analogy making comparisons, stating reasons why the other point of view is less legitimate than yours. Time to time in writing; define the background information on the subject and the different terms which may be imposed on the subject. The last paragraph should always be summarizing the very important final factor of the persuasive writing and should encourage the reader to view the subject from the writer’s perspective. The closing statement should be impactful and should leave an impression in the minds of the readers as they finish reading the essay. It is very important to revise the essay after writing the first draft. Revising the essay helps in eliminating any extra passages and making the essay concise. The writer has to review, modify as well as reorganize the work as per the need. He or she should keep in mind some pointers before revising the essay. The writer has to ensure whether the essay presents a stern position on the issue or topic and whether it is supported by some relevant statements or not. The writer has to see if the interesting value of the essay is maintained or not. The essay should not be too dull or somber. The essay should make the reader think and act as per will. This is a very important part of any essay or article writing, editing the essay. The proofreading part should be done with utter concentration and with sound knowledge of the structure or format followed for writing the persuasive essay. Editing parts help in correcting the grammatical errors, mechanics and seeing any omissions if there. Make your friend or a family member read it aloud. It will help in pointing out any mistakes if there are any. The final part is to publish your essay after all the revising, editing and proofreading. There should not be any hesitation or play back while presenting your essay. Be as confident as you can and present your point. In this part, the writer has to start the essay with an interesting hook or an anecdote to ensure the reader’s interest in the essay. Give an overview of the point stated in the persuasive essay which you have written. Close with a thesis statement which prominently reveals the position which is to be argued. The body paragraph is the main crux of any persuasive essay and should focus on the major pointers which facilitate the point. Each paragraph of the body should be self-evaluating and should stand with relevant facts and examples. This paragraph should describe and then refute all the claims and key pointers which the opposing view states. This paragraph is also important as it will influence the reader to not take the other side. In the very end, conclude the persuasive essay with a thesis and supporting evidence and tell the reader why to think and act in the favor of the supporting point. Should a college education be free for everyone? Is there an equal representation of genders in politics? Should citizens be allowed to keep exotic pets?